As far as I know, Happy Okuoka of Heartland FC has never played a minute of football in the Nigeria Premier League (level one) , the Nigeria National League (level two) or for any of the Nigerian national teams. Nevertheless, the young striker is one of the hottest prospects in Nigerian football. For several years, Okuoka has been a “underground” star in Nigerian grassroot football. Apparently, Okuoka participated in the 2008 MTN Lagos Street soccer competition. In May 2009, he was picked in the squad of the Nigeria Beach Soccer Team. In 2010, Okuoka played for a team called “401 Road Planners” during the Gulder Ultimate Five-A-Side competition. Okuoka became top scorer of the tournament. In March and April 2012, Okuoka became top scorer of the “Jago Lagos Mock World Cup”, an amateur tournament designed to unearth young talents from the grassroots of Nigerian football. Apparently, Okuoka scored five goals during the tournament. In 2012, Okuoka joined an amateur football club from Lagos, called Paddysco International Football Club. Before joining Paddysco International Football Club, Okuoka was apparently connected to amateur club Festac Town. In late 2012, Okuoka made a dream move to Owerri-based Heartland FC, a powerhouse of Nigerian football. 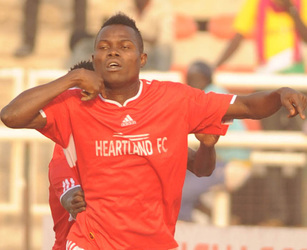 Okuoka scored his first offical goal for Heartland FC on 13.12.2012 when the “Naze Millionaires” won 2-0 against Kano Pillars FC in the Charity Cup final. In January 2013, Okuoka scored two goals during the Super 4 tournament in Kano. Okuoka was also named as the Most Valuable Player of the tournament. In other words, Okuoka has already shown that he is able to perform brilliantly against the best teams of Nigerian football. Okuoka has been described as “a fighter with an eye for goals”. He is known for pace, strenght and a healthy work rate. Okuoka is predominantly right footed. The full name of Okuoka is “Fredrick Happy Okuoka”. He is also referred to as “Fredrick Okuoka” or “Happiness Okuoka”. According to MTN Football, Okuoka is on the radar of Turkish second level club Konyaspor. Personally, I think Okuoka should stay at Heartland FC. If he is able to maintain his amazing form during the up-coming season, more interesting offers will surely come his way. Unfortunately, there seems to be some confusion regarding the age of Okuoka. According to paddyscosports.com, Okuoka is born 29.11.1993. In December 2012, Sports Day wrote that Okuoka was 18 years old, suggesting that he is born in 1994 or late 1993. In other words, the information at paddyscosports.com corresponds well with the information from Sports Day. In January 2013, the official webpage of Konyaspor published an article where it was stated that Okuoka was 20 years old and born in 1993. This information suggests that Okuoka is born in January 1993. The Gulder Ultimate Five-A-Side competition has been arranged in 2010, 2011 and 2012. The “Terms & Condition” from the 2012-tournament clearly states that all participants must be “18 years and above”. As already mentioned, Okuoka participated in the 2010-tournament. I have not been able to find the “Terms & Condition” from the 2010-tournament but in March 2010, the Daily Independent wrote that all players who wanted to take part in the 2010-tournament had to be “18 years and above”. This piece of information suggests that Okuoka is born in 1992, 1991 or earlier years. A Lagos-based striker called “Fredrick Okuoka” has a profile on MyBestPlay. According to this profile, that was published in 2008, Okuoka is born 18.05.1991. Obviously, I am not sure that Happy Okuoka and the “Fredrick Okuoka” presented at MyBestPlay is the same player. From my point of view, it is not that interesting whether Okuoka is 18, 19, 20, 21 or 22 years old. In any case, Happy Okuoka is a young, talented player who should be watched closely in the continuance. The picture of Okuoka was found on MTN Football.